Lakefront Port Orchard Home w/ 2 Decks & Hot Tub! Discover the charming city of Port Orchard from this 3-bedroom, 1-bathroom vacation rental house that sleeps 5! This beautiful home boasts 2 spacious decks, a fire pit and hot tub, along with a prime waterfront location on Long Lake and a dock. Partake in a variety of watersports from your own backyard or plan a day trip up to the Hood Canal for some oyster hunting. For even more area adventures, hop a ferry over to Bremerton or browse the antique shops along Bay Street! With all white siding and contemporary-style furnishings, the home’s interior features a sleek and sophisticated feel throughout. An open layout and a full wall of picture windows keeps the main living space brightly lit with natural light and offers serene views of the lake. Nestled among the wall of windows is a set of french doors leading out onto the deck. Make your way outside to get a closer look at the water and the lush evergreens that border it. When you’re ready to speed up the pace, head down to the dock to get the water festivities started! After a long afternoon on the water, the fully equipped kitchen is primed to handle all your cooking needs. The space features modern appliances, glossy countertops and bright white cabinetry to further the home’s contemporary design. Have a quick bite at the 2-person breakfast bar or take a seat at the dining table to share a meal with the whole group. After you digest your food, head out to the deck and step into the hot tub for a relaxing soak. Wind down before bed in the living area, where you’ll find a futon and 2 plush chairs situated around a flat-screen cable TV. Open up the french doors to let a cool breeze blow in and get one more glimpse at the glistening water before bed. Break for the bedrooms when your eyes can’t stay open a second longer. The master bedroom features tasteful travel posters and a queen-sized bed, while the second bedroom comfortably sleeps 3 in a twin-over-full bunk bed. Take no more than a couple of steps out the back door for wonderful views, watersports and more! 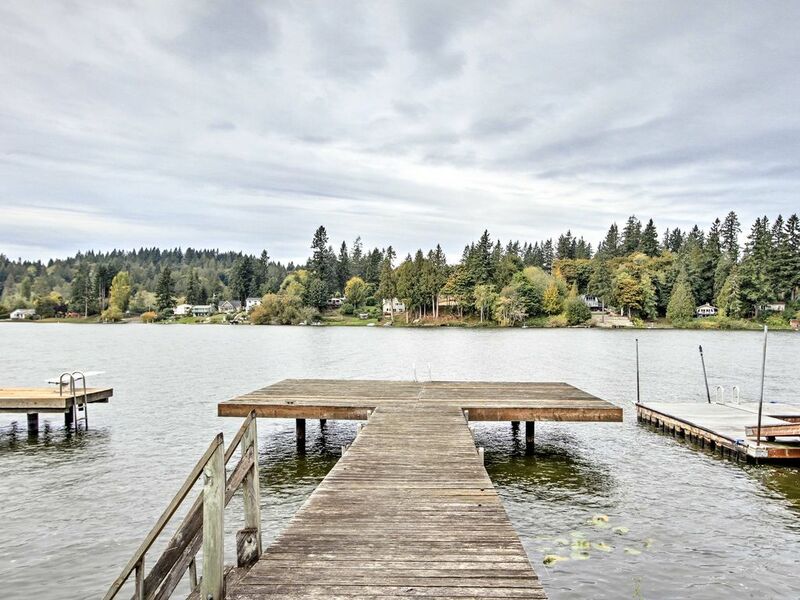 Make use of the home’s private dock as you explore Long Lake, a popular spot for fishing fanatics and boating enthusiasts. If golfing is more your sport, you’re in luck! Visit McCormick Woods Golf Club for a premier golfing experience or practice your swing in the wooded enclaves at Gold Mountain Golf Club. Take a day to explore Bay Street and the older sections of town, where you can browse for local treasures at the antique shops and take the kids over to the park to play. Catch a ride on the foot passenger ferry over to Bremerton, home to beautiful state parks and numerous historic sites. For even more waterside fun, head up to Hood Canal for oysters and live music! For a day closer to home, you can drive to numerous shops, restaurants, theaters and other entertainment venues in 10 minutes or less. Open spaces, newly updated, very clean and easy to access. The owners obviously love their lake house and their guests. I was impressed to find coffee beans and a grinder, cookies, plenty of towels, all the comforts you need to really enjoy your stay. Lovely spot. A real treasure. Everything was there, beautiful and well set up for a quick visit or longer stay!! The house is bright and cheery, well appointed with essentials and located in a beautiful, quiet setting which was close to restaurants and grocery stores. The contact for the property was responsive when needed. Better beds, bedding/linens, and pillows would've made the stay more comfortable. And I would've appreciated notification when people would be coming. Twice, I was surprised by strangers coming to the property. One to check the hot tub, which wasn't working at the time and on another morning, I looked out the window to see a man just standing in the yard. He left once he saw me, but I have no idea why he was there, and it made me feel a bit uncomfortable. Overall, my 2+ week stay was positive and the house met my needs. Great little cottage on the lake! We enjoyed our stay. They had everything we would need and then some. Clean and cozy. We stayed for five nights in November and although this is more suited to be a summer cottage, we enjoyed our stay. The kitchen is roomy and well stocked with utensils, appliances (including a coffee grinder), dishes and some basic cooking supplies (oil, spices, etc.) which is very useful and appreciated. There was a fire log provided, but we didn’t have a chance to use it. The welcome package of snacks and drinks was a nice touch. The bathroom has a heated floor and plush towels - a nice change from many rentals. With numerous skylights throughout the cottage, and the whole front of the cottage facing the lake composed of windows and a door, it is very bright in the living, dining and kitchen areas. The bedroom areas, because they look out to the side yard or garage, are not as bright. The master bedroom backs onto the street, so you do hear the traffic, although the road is not too busy. There are a few furnishings that need updating that I contacted the owner about and who was very responsive. It is a bit disconcerting to walk through the garage to enter the house, but once you see the view, you don’t mind - the lake is lovely. There is a very large upper deck that we didn’t use due to the weather but we walked down to the dock, which is huge. Overall, it is a lovely cottage that could accommodate quite a few people. Nothing fancy, the deck could use a new coat of paint, couldn't get the golf channel on the TV, but this place was perfect for us. It was very comfortable, clean, and had everything we needed. We will definitely stay here again if we do this trip next year.